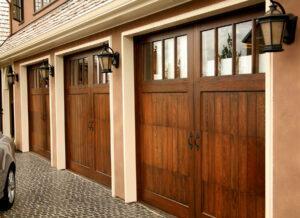 Garage doors may be made up of three or more panels, especially if you have a roll up sectional garage door. If a door is worn or damaged, sometimes the problem is limited to a single panel. Replacing garage door panels individually can be tricky. Some people believe you can mix and match, but this generally isn’t a good idea. The only instance when panels might be interchangeable is if they’re from the same manufacturer and the company has created different products with very similar designs. This is very rarely the case as most manufacturers design a variety of different panels and engineer them so differently. Any reputable company will go to great lengths to ensure their products stand apart from other brands. Aesthetics: Installing a different panel with others on your garage door doesn’t promise they’ll match up. Even if you don’t care that much about a perfect match, patterns such as raised squares will be uneven. Whether the average person will notice or not, the results can negatively affect curb appeal and will certainly be scrutinized by anyone potentially looking to buy your home. Integrity: Even slight differences in measurements can compromise your garage door’s structural integrity. Variations in size and weight might be minute. However, they can set the door off balance and strain a variety of mechanical components, causing them to malfunction and/or fail prematurely. If you are trying to save by interchanging parts, you’re most likely setting yourself up for spending more later. Hidden damage: Some homeowners look to replace individual panels to repair damage. This is not an effective form of garage door repair. The reason being if something impacted your door, chances are the forces affected the garage door track, a sensor, a spring, or the garage door opener mechanism. In that case, the door’s functionality will be compromised even if the panel is replaced. If your garage is attached to your home, you don’t want to risk interchanging panels. The cosmetic impacts alone can be detrimental. But you may also be compromising weather resistance and insulation, which can decrease energy efficiency, and also security because it may be easier for criminals to see a compromised door and break in. A quick fix is therefore bad for many reasons, and probably won’t last you very long. Eventually, every garage door needs to be replaced and a new garage door installation can save you in the long run, and be beneficial in terms of function, aesthetics, and safety. If for any reason your garage door is damaged or you wish to perform an update, contact a garage door repair professional who is trained to provide all kinds of service. A trained technician can thoroughly inspect the door to determine the scope of the damage. They may also be able to determine if there are compatible panels. In any case, you’ll receive professional advice on how to proceed. The garage door is an important part of your home’s functionality, efficiency, and security, so don’t make any moves that can jeopardize its safety. Call Precision Door Service of Fresno at 559-480-2955 if you need garage door repairs, maintenance, or installation, or set an appointment by submitting our online request form today.